Happy 3rd Birthday Blog ! Finally! Annie joined us playing ball with Dad! First she took my ball when I came out of the water. I barked at her that my ball is off limits and she dropped it. Then when Rosy was running with the ball, Annie ran over and Rosy dropped it for her so she could play and she did! I guess even though Rosy is little, shes a bigger dog than I am! The other day, we took a beach walk on the far south side of the beach. There are all these cool rocks and stuff there on low tide. Rosy and Annie kept very busy sniffing all the sea smells. 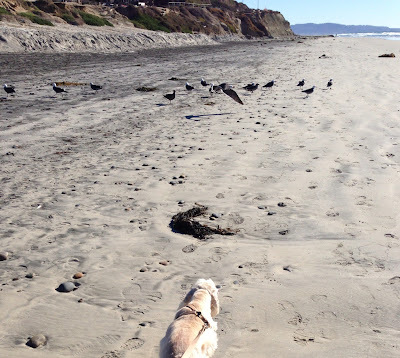 I got bored sniffing after awhile because there are no tennis ball smells in this part of the ocean. To celebrate my blog's birthday, Mom got us each a cupcake. Of course we had to take a pic first. Annie totally did not understand why we couldn't just eat them immediately. Then when we got to eat them , Rosy surprisingly resisted her pink cupcake. She feels cupcakes aren't worth the calories unless they are made out of tuna. OMD! My blog is 3 years old today! I remember when it was born (my first post). So I looked up astrology of those born on January 25th. And I think it describes my blog well! Again this year, I am celebrating my blog's birthday with a donation to the place that rescued me - Retrievers and Friends of Southern California. I will withdraw from my doggy bank $1 for each comment left on this post. Please tell me how you would describe my blog. Only one comment per anipal please, but it can be long and full of compliments. Since Annie has been a very good girl with her training and I am a hero, we were all treated to a pizza picnic. This is the first pizza meal that we have had together since Annie's arrival (3 weeks, is that possible?) Well, she obviously had pizza before. She knew exactly what was in the box, and is an expert slice biter. She also chose to stay between me and Rosy, so I think she got more than me! Next time, I will ask Dad to get two pizzas for our expanded family. Mom continues to be obsessed with taking random pictures of us all day with her iPhone. I just deal with it cause it makes Mom happy. Annie is new, so she is still OK with it. Rosy however, is getting a bit annoyed. 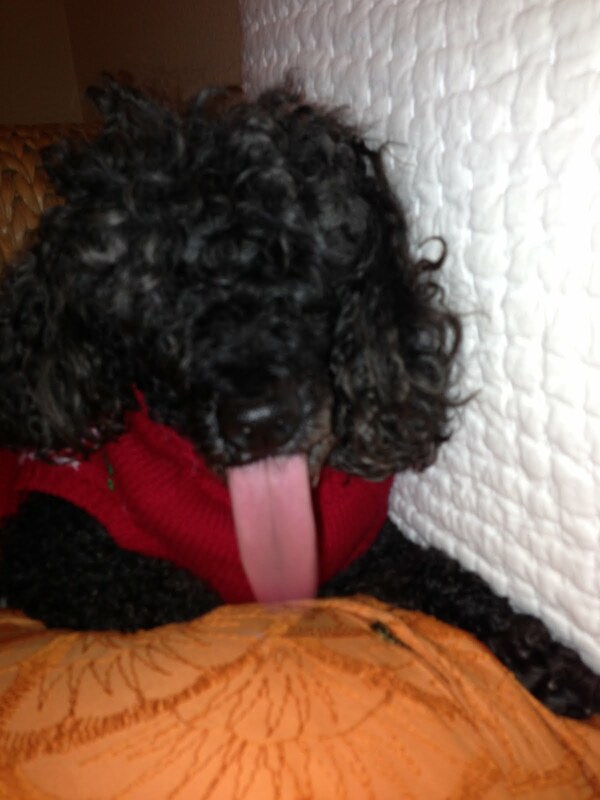 She has this new habit of sticking her tongue out when Mom disturbs her with the iPhone. I thought Rosy would get in trouble for being rude. But instead it makes Mom laugh. I dont get it. The National Hockey League (NHL) season finally begins! YAY! 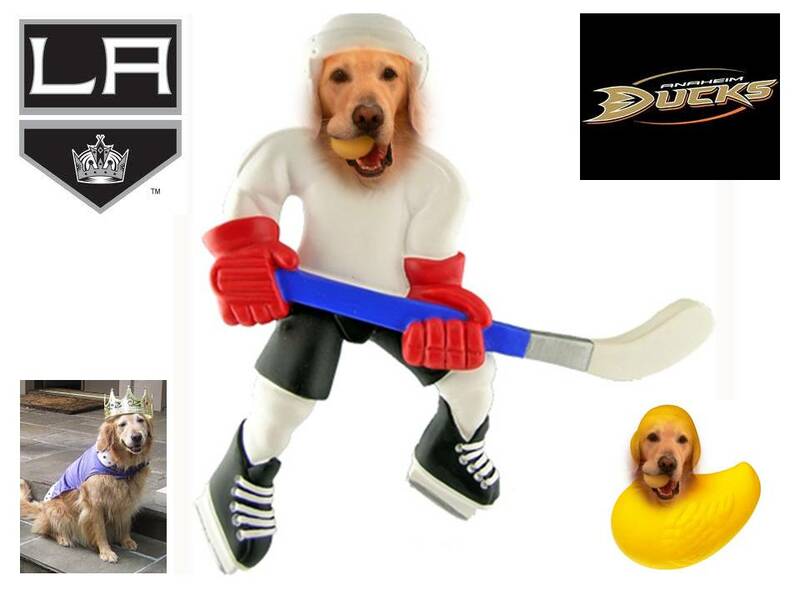 I just can't decide which Southern California team I should root for: On the one paw, the Los Angeles Kings are the reigning champions plus I really like my King outfit. On the other paw, the Anaheim Ducks haven't done so well lately but they have always been Mom's fave. Plus, everyone loves what I look like as a duck. Who do you think I should root for? Chanps or Underducks? 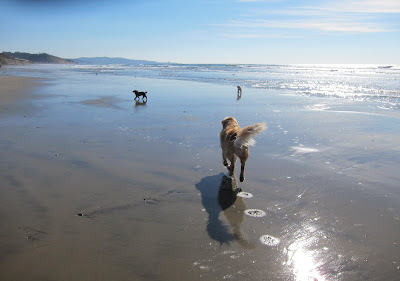 Mom usually walks Annie while Rosy and I go with Dad to play beach ball and swim. 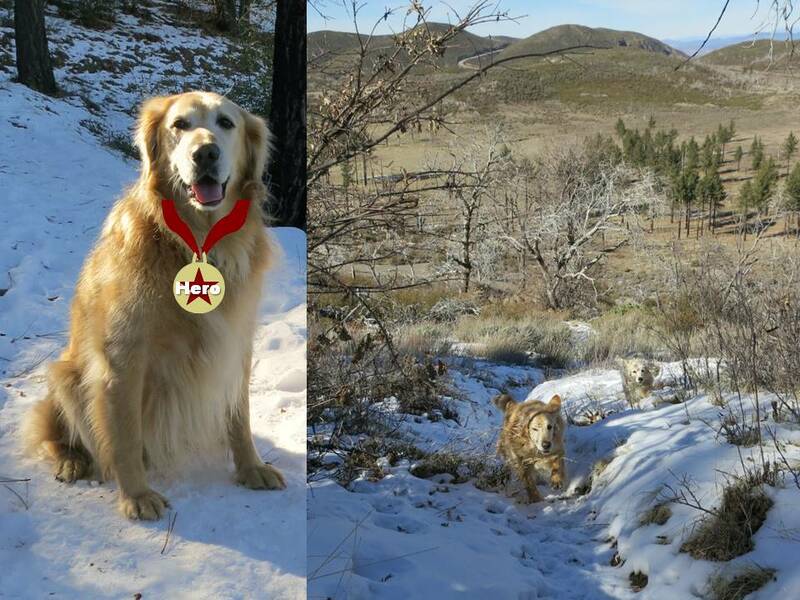 But the other day Rosy and I joined Annie and on her walk, or should I say run! 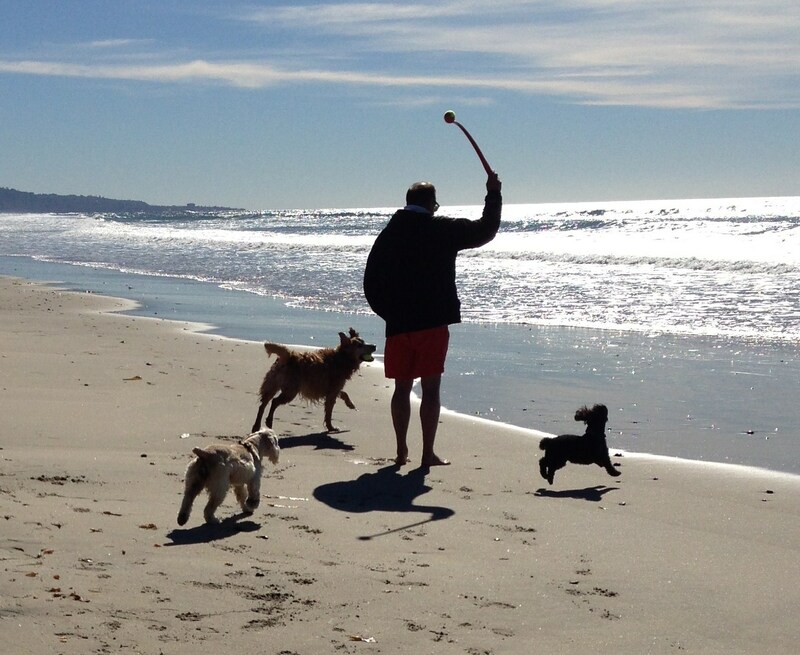 Before, I was wondering why she had no motivation to chase the ball at the beach. Now I understand. She is obsessively motivated to chase birds! Uh Oh. I think I need to send out a cautionary alert to the beach birds. The other day we went to PetSmart and. I saw too adorable kitties for adoption. I asked Dad if we could get them. He told me that since we got Annie, that makes three and that is all we can have in the house. But I told him that three canines and two felines would make a full house. Dad said we already have a full house with three canines and two humans. I guess that beats my full house. 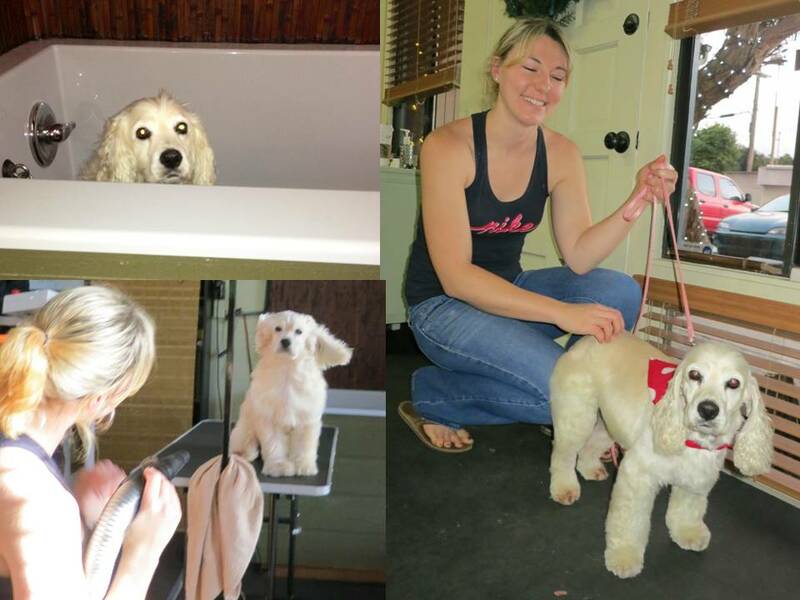 "First I had a soothing warm bubble bath with a wonderful massage. Then I was blow dried with warm fragrant air. I asked for a Californai Girl Cocker cut and it was expertyly styled. As a final touch I had my nails done. To complement my new look, I received a fashionable retro red polka dot bandana. Overall, I give 5 stars to my spa experience with Sara!" Annie is obviously adjusting well to her new life. I forgot to tell you what happened on our snow day. Annie was off leash and going very fast. It was OK cause she was staying on the trail.and we could see her ahead of us. But then, she went off on a different trail that went all the way down the mountain. Mom and Dad kept calling her but she ran further down and was about out of our sight. It was really steep, but I knew what I had to do. Bear to the rescue!. So I ran down and herded her to follow me back up the mountain. Mom and Dad told me I was a hero. I am so proud! The other day we drove about an hour to Mount Laguna and got to hike and play in the snow! Rosy and I haven't been in snow since Memphis. I remembered rolling and stick collecting. 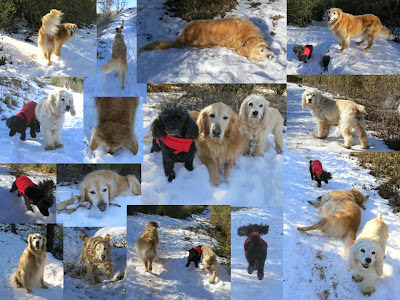 Rosy remembered how to snow fly! Annie went into her speed walk and sniff mode. I just absolutely love snow. Don't you? Today is Elvis Presley's birthday. Born in 1935, he would have been 78 years old today. Having lived in Memphis for a year and a half, and going to see Graceland, I got a true appreciation for the King and his great music. 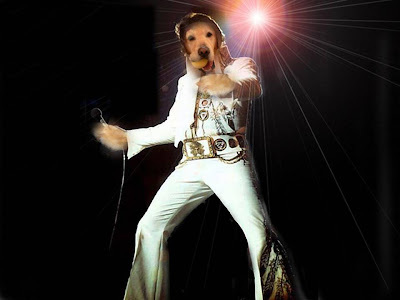 So today got me to thinking ... what must it be like to be like Elvis? ... I guess this hound dog would have be called Bearvis. The other day at the beach, I told Annie to watch me chase the ball in the water. I told her to also watch Rosy to see how she goes in the water to get the ball but doesnt have to swim. I figured maybe that is what Annie would like to do. But instead. She picked up her ball and walked away from the water. I guess it is going to take time to teach her how to be a beach dog like me and Rosy. Since it has been "cold" here in San Diego, each of us got a new sweater. Rosy's is very fancy and of course pink. I picked mine out -- the closest thing I can get to a Mom tattoo. And Mom and Dad got Annie a nice one too. She just doesn't understand why Mom has to take pics of us in the sweaters. She thought they were just to keep us warm. She will learn. Annie, Rosy and I want to wish everyone around the world a very happy new year. 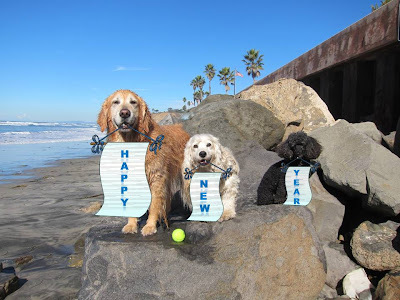 We hope everyone's 2013 is wonderful, safe and filled with lots of smiles and sunshine.